Political and religious leaders have led the way in expressing solidarity with the people of France as the world absorbs the shocking images of the burning of the Notre Dame Cathedral in Paris. President Emmanuel Macron of France was among the first to react to the shocking scenes, as the iconic building caught fire Monday night. "Notre-Dame is aflame," he wrote on Twitter. "Great emotion for the whole nation. Our thoughts go out to all Catholics and to the French people. Like all of my fellow citizens, I am sad to see this part of us burn tonight." Barack and Michelle Obama shared messages on both Twitter and Instagram, respectively, to share their personal memories of the Cathedral and say that "we're thinking of the people of France in your time of grief." Michelle Obama recalled the "majesty of Notre Dame" taking her "breath away" the first time she was there, as "a teenager on a school trip to Paris." "So being here in Paris tonight, my heart aches with the people of France," she wrote. "Yet I know that the Notre Dame I experienced all those years ago, as so many others have over the centuries, will soon awe us again." I will never forget the first time I walked into the Notre Dame Cathedral. I was a teenager on a school trip to Paris. It was my very first international trip, and until then, I hadn't seen much outside of the South Side neighborhood I grew up in. But the majesty of Notre Dame—the history, the artistry, the spirituality—took my breath away. The feeling was almost indescribable—a place that lifts you to a higher understanding of who we are and who we can be. Every time I've visited in the years since, including as First Lady, I felt the same thing. So being here in Paris tonight, my heart aches with the people of France. Yet I know that the Notre Dame I experienced all those years ago, as so many others have over the centuries, will soon awe us again. PHOTO:Firefighters spray water as they work to extinguish a fire at Notre-Dame Cathedral in Paris early on April 16, 2019. Queen Elizabeth II sent a personal message to President Macron seen by ABC News, in which she said, "Prince Philip and I have been deeply saddened to see the images of the fire which has engulfed Notre-Dame Cathedral." "I extend my sincere admiration to the emergency services who have risked their lives to try to save this important national monument," she wrote. "My thoughts and prayers are with those who worship at the Cathedral and all of France at this difficult time." 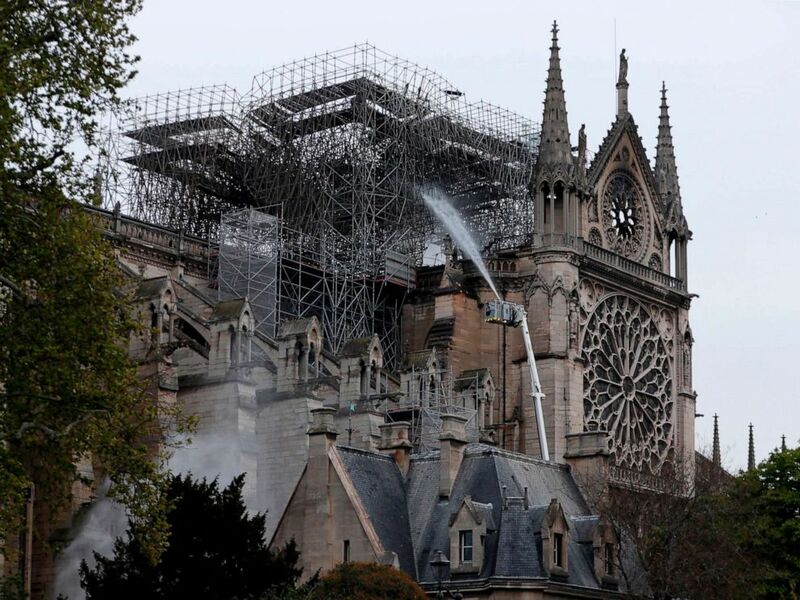 Pope Francis was said to be praying for "all those who are striving to cope with this tragic situation," according to the Director of the Vatican Press Office, Alessandro Gisotti, who described Notre Dame as "a symbol of Christianity in France and in the world." He later posted another tweet saying, "God bless the people of France!" After initially reacting to the shocking images, most of the messages from world leaders proclaimed this was a time to come together in the aftermath of a great tragedy. President Macron posted on Twitter Monday night it was "part of our French destiny" to rebuild to cathedral "all together." "Tonight we pray for the firefighters tackling the tragic #NotreDame fire - and for everyone in France and beyond who watches and weeps for this beautiful, sacred place where millions have met with Jesus Christ," Welby posted on Twitter. "Nous sommes avec vous." But it was the video of bystanders singing "Ave Maria" as the cathedral was engulfed in flames that arguably had the biggest impact worldwide.